O God, who raised up Saint Ignatius of Loyola in your Church to further the greater glory of your name, grant that by his help we may imitate him in fighting the good fight on earth and merit to receive with him a crown in heaven. Through our Lord Jesus Christ, your Son, who lives and reigns with you in the unity of the Holy Spirit, one God, for ever and ever. In the year 1521 a cannon ball fractured the left leg of Captain Ignatius Loyola, the future founder of the Jesuits. While he was convalescing, Ignatius read about Christ and His saints and thus turned wholly to God. He then undertook to equip himself for Christ's service by acquiring a good classical and theological education. The members of the Society of Jesus became the shock troops of the Church in the battle against the spread of Protestantism in Europe, as well as one of the greatest foreign mission organizations that the world has known. Ignatius died on July 31, 1556. 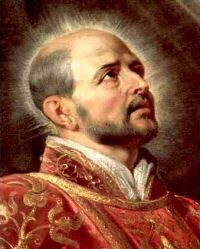 See Catholic Culture's special section on St. Ignatius. Ignatius, by nation a Spaniard, was born of a noble family at Loyola, in Cantabria. At first he attended the court of the Catholic king, and later on embraced a military career. Having been wounded at the siege of Pampeluna, he chanced in his illness to read some pious books, which kindled in his soul a wonderful eagerness to follow in the footsteps of Christ and the saints. He went to Montserrat, and hung up his arms before the altar of the Blessed Virgin; he then watched the whole night in prayer, and thus entered upon his knighthood in the army of Christ. Next he retired to Manresa, dressed as he was in sackcloth, for he had a short time before given his costly garments to a beggar. Here he stayed for a year, and during that time he lived on bread and water, given to him in alms; he fasted every day except Sunday, subdued his flesh with a sharp chain and a hair-shirt, slept on the ground, and scourged himself with iron disciplines. God favored and refreshed him with such wonderful spiritual lights, that afterwards he was wont to say that even if the Sacred Scriptures did not exist, he would be ready to die for the faith, on account of those revelations alone which the Lord had made to him at Manresa. It was at this time that he, a man without education, composed that admirable book of the Spiritual Exercises. However, in order to make himself more fit for gaining souls, he determined to procure the advantages of education, and began by studying grammar among children. Meanwhile he relaxed nothing of his zeal for the salvation of others, and it is marvelous what sufferings and insults he patiently endured in every place, undergoing the hardest trials, even imprisonment and beatings almost to death. But he ever desired to suffer far more for the glory of his Lord. At Paris he was joined by nine companions from that University, men of different nations, who had taken their degrees in Arts and Theology; and there at Montmartre he laid the first foundations of the order, which he was later on to institute at Rome. He added to the three usual vows a fourth concerning missions, thus binding it closely to the Apostolic See. Paul III first welcomed and approved the Society, as did later other Pontiffs and the Council of Trent. Ignatius sent St. Francis Xavier to preach the Gospel in the Indies, and dispersed others of his children to spread the Christian faith in other parts of the world, thus declaring war against paganism, superstition, and heresy. This war he carried on with such success that it has always been the universal opinion, confirmed by the word of pontiffs, that God raised up Ignatius and the Society founded by him to oppose Luther and the heretics of his time, as formerly he had raised up other holy men to oppose other heretics. He made the restoration of piety among Catholics his first care. He increased the beauty of the sacred buildings, the giving of catechetical instructions, the frequency of sermons and of the sacraments. He everywhere opened schools for the education of youth in piety and letters. He founded at Rome the German College, refuges for women of evil life, and for young girls who were in danger, houses for orphans and catechumens of both sexes, and many other pious works. He devoted himself unweariedly to gaining souls to God. Once he was heard saying that if he were given his choice he would rather live uncertain of attaining the Beatific Vision, and in the meanwhile devote himself to the service of God and the salvation of his neighbor, than die at once certain of eternal glory. His power over the demons was wonderful. St. Philip Neri and others saw his countenance shining with heavenly light. At length in the sixty-fifth year of his age he passed to the embrace of his Lord, whose greater glory he had ever preached and ever sought in all things. He was celebrated for miracles and for his great services to the Church, and Gregory XV enrolled him amongst the saints; while Pius XI, in response to the prayers of the episcopate, declared him heavenly patron of all Spiritual Exercises. Excerpted from The Liturgical Year, Abbot Gueranger O.S.B. Patron: Basque country; Jesuit Order; Jesuits; retreats; soldiers; Spiritual Exercises (by Pope Pius XI). Symbols: Book; chausible; Holy Communion; a rayed IHC or IHS; heart with crown of thorns; sword and lance upon an altar; book with words Ad Maiorem Dei Gloriam. Learn more about St. Ignatius and the Jesuit Order and/or read this biography by John Farrow, St. Ignatius of Loyola. If you have never done so, consider making the Spiritual Exercises. You can find it online here or you may purchase a copy from Catholic First. The Jesuits at Georgetown have a collection of St. Ignatius' Letters and Instructions to his fellow Jesuits. Much of his spiritual teaching is found in his letters and is considered an important source of Jesuit spirituality. If you are interested in reading them click here. St. Ignatius founded his Society to give the greatest possible service to the Church and to the Pope. In addition to vows of poverty, chastity and obedience, Jesuits take a special vow of loyalty to the Pope. Today would be a good time to say a prayer for Pope Francis. In the Spiritual Exercise, St. Ignatius strongly recommends making a daily examination of conscience. If this is not part of your schedule today would be a good time to start.